In recent years, near-biblical floods have become a constant feature of the global news: Hurricane Katrina stranding grandmas on their roofs in New Orleans, monsoon floods devastating Nepal, or Hurricane Maria unleashing its deadly deluge on Puerto Rico, for instance. But a quieter, more insidious breed of inundation is increasingly consuming towns and cities along the U.S. coastline and around the world. It’s called sunny day flooding. Alternately referred to as tidal flooding, high-tide flooding and nuisance flooding, sunny day flooding can happen under blazing, cloudless skies and is perhaps the most tangible sign of climate change yet, say scientists. It’s not new, but it’s happening much more frequently due to climate change-related sea level rise, the erosion of natural coastal barriers, and land subsidence, or the gradual sinking of the ground in places where cities are built on sediments rather than bedrock. Combined, these forces push the highest of tides into coastal towns and cities, bringing floods that can close roads, overwhelm storm drains, damage infrastructure and property, and threaten public health. Sunny day flooding has already increased on all three U.S. coasts by 300 to 925 percent since the 1960s, according to the National Oceanic and Atmospheric Administration. It is partially responsible for driving a small tribal community from the Isle de Jean Charles out of the Louisiana bayou, and is slowly making atolls like the Marshall Islands disappear. In the United States, the East and Gulf coasts are most vulnerable—particularly parts of southern Florida (including Miami) and New Orleans, where more than 10 percent of the city’s area is chronically inundated, meaning it floods at least 26 times a year. Sunny day flooding could make many places unlivable in the coming decades, and few communities fully grasp the risks. Building up sand dunes and walls can provide some temporary relief, says Kyle Mandli, an assistant professor at Columbia’s Department of Applied Physics and Applied Math, who studies the physics of destructive waves, including storm surges related to hurricanes. “But if [the sunny day flooding] continues to increase, at some point you’re in an aquarium,” he says. Some researchers have argued that such chronic flooding could surpass extreme weather events when it comes to cumulative property damage. To understand how sunny day flooding works, you have to understand the tides. Twice a month, when the sun and the moon are aligned with Earth in their orbits—during a new or full moon—the gravitational tug they exert on the oceans is strongest, yielding what are called king tides or “spring” tides, so named because these tides can “spring the banks.” The flooding that may result is exacerbated if the moon is also at its closest point to Earth, known as its perigee. Three or four times a year, these perigean spring tides can cause minor—or occasionally major—coastal flooding. How bad and how widespread sunny day flooding gets will depend on how fast sea level rises. Today, sea levels are creeping upwards by a foot per century in some places along the eastern coast of the U.S, but in the worst-case scenario, scientists estimate they could climb by a foot per decade by the end of this century. If sea level rise is only moderate, nearly 170 coastal U.S. communities will be chronically flooded by 2035, according to a report published by the Union of Concerned Scientists in 2014. That’s about twice as many as today. Almost three quarters of these 170 communities are in Louisiana and Maryland, which are sea level rise “hotspots” due to low elevations, land subsidence, and, in Maryland, regional ocean currents. If sea level rise is more rapid, nearly 670 coastal U.S. communities will face chronic inundation by the end of the century, including more than 50 heavily populated areas—such as Oakland, California; Miami and St. Petersburg, Florida; and four of the five boroughs of New York City. The local magnitude of sea level rise is influenced not just by low land elevation and subsidence, but by a place’s glacial history. Land that was depressed under the weight of a glacier—for instance much of the eastern coast of Canada down to New York was buried under ice 10,000 years ago—takes centuries to rebound. Local sea level rise can also be enhanced by ocean currents, temperatures and salinity, as well as proximity to the melting glaciers in Greenland and Antarctica. “You have these variations in water level due to good old physics, but as you increase the sea level, the tips of those high water levels can be amplified,” says Klaus Jacob, an expert in natural disasters coastal storm consequences at Columbia’s Lamont-Doherty Earth Observatory. 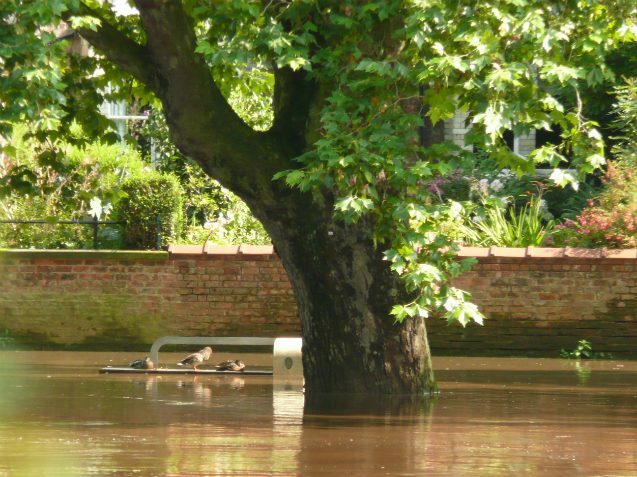 A city or town’s infrastructure, such as its drainage system quality and how much of its land is covered with impervious pavement, can also influence its risk of flooding, says Andrew Kruczkiewicz who specializes in satellite imagery of flooding and other hazards at Columbia’s International Research Institute for Climate and Society. In some cases, tidal flooding can come up via the sewer system, says Kruczkiewicz, so the zones that can be hit are different from those impacted by hurricane storm surge. This isn’t always acknowledged in flood warning systems, a fact that can leave residents confused and poorly prepared, he says. Kruczkiewicz is currently working on a project with WNYC (a New York City-based public radio station) to help people understand their risk levels for different kinds of flooding. In the meantime, the Union for Concerned Scientists has an interactive map that shows flooding levels throughout the U.S.—both now and in the future.